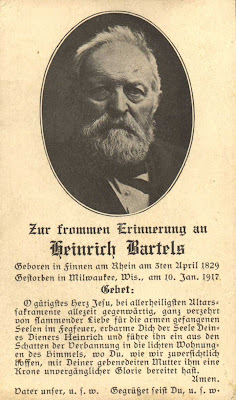 Note: Heinrich Bartels is one of Ferdinand Bartels' older brothers. He immigrated to the US and lived with Ferdinand and family in Milwaukee (see 1900 Census). I've nominated you for the "I love your blog" award. I am looking for someone to speak about Milwaukee's german history at a monthly dinner we are having. If you are interested, email me at mzozak at deltrol dot com.